The hardest tooth in the mouth to restore is one of the four maxillary incisors, because they are directly in the line of sight and are being compared to the other incisors next to them. Even more difficult than that is the restoration of an implant in that location. 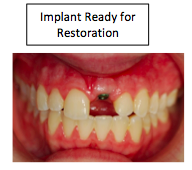 Unless the implant is precisely placed using a very accurate surgical guide, the restoration can end up looking bulky, too opaque, and not a match for the adjacent teeth. 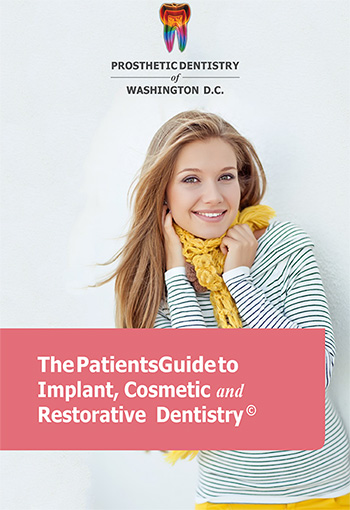 At Prosthetic Dentistry of Washington, D.C. (located in the Washington, D.C.-Bethesda area), Dr. Marlin uses “guided surgery” using custom surgical stents when inserting all of his implants. 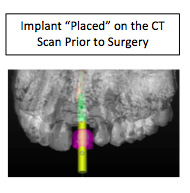 Using extensive presurgical planning via a CT Scan (3D image) of your jaw, Dr. Marlin is able to precisely plan the angle, depth, and location of each implant prior to the surgery as he “places” them directly on the CT Scan. In many cases, he has the CT Scan software company create the surgical Guide, especially when inserting anterior implants where the aesthetics has to be very exact. 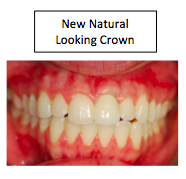 This precise planning allows him to actually design how the abutment that comes out of the implant and holds the crown will be located in relation to the restoration. The Result: a happy patient!